SPANISH maritime rescue services have saved an unnamed migrant found floating 10 kilometres out-to-sea on a lorry tyre inner tube. He was reportedly first seen by crew of the Kattegat cargo ship off the coast of Punta Carnero near Algeciras. Crew raised the alarm with Tarifa maritime authorities who then sent the red Salvamar Arcturus lifeboat to rescue the man. The unnamed migrant was found in good health and taken to Tarifa port in Andalusia. The strait of Gibraltar is a stretch of water – 7.7 nautical miles wide at its narrowest – separating Morocco in Africa from Gibraltar in Spain. It connects the Atlantic Ocean to the Mediterranean Sea. Spanish coastguard said that five people died and 185 were rescued trying to cross the waters into Southern Spain since Wednesday. Rescue boats, helicopters and planes worked together in the life-saving operations, an official said. 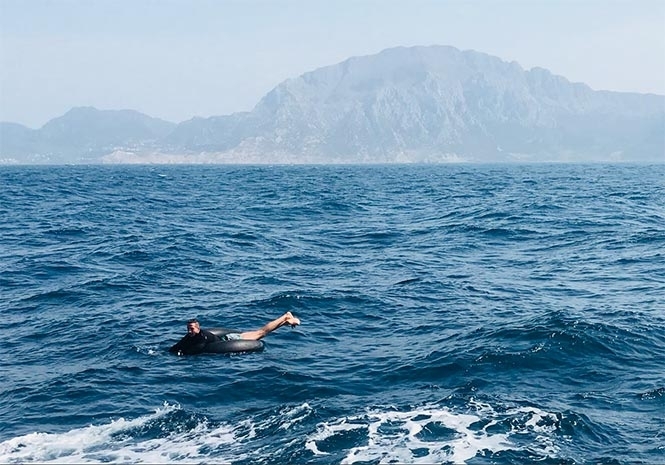 One boat capsized and four migrants drowned 40 kilometers off the Moroccan coast. One of the five dead was rescued but later died of a heart attack. The search continued yesterday (Thursday) for a further two boats carrying 45 people in Mediterranean. Bad weather stopped helicopters and planes from joining the search but has now passed. After Italy and Greece, Spain is Europe´s third busiest migrant entry point. Already this year about 3,778 migrants have entered Spain after risking it on the crossing, according to International Organization for Migration figures. So far more than 180 people have died since January, compared to a total of 223 during the whole of 2017.